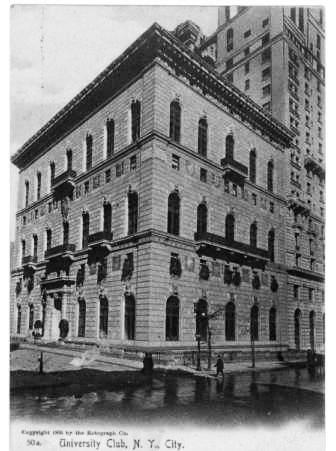 After moving from one temporary club house to another, the group leased the former Leonard Jerome mansion at 26th and Madison Avenue on December 3, 1883 for $22,500 per year. This was the heyday of the gentlemen’s club – quiet, posh dens where men of means could relax, smoking cigars and discussing business and current events. Female intrusion into a men's club was unthinkable. The University Club was not only successful, it became prestigious. Ten years after settling into the Jerome mansion, spacial restrictions caused membership to be capped at 1500 New York members and 900 members living elsewhere. No fewer than 600 gentlemen waited impatiently to join. A larger facility was necessary. On the west side of Fifth Avenue the Vanderbilt family had recently built six grand mansions that stretched from 50th Street to 58th. In the center of “Vanderbilt Row,” however, was St. Luke’s Hospital between 54th and 55th, sitting back from the avenue and encircled by a lawn. In 1893 the hospital announced its intentions to move north to 113rd Street. After intense negotiations and even more intense fund raising, the plot was secured and a new club house planned. 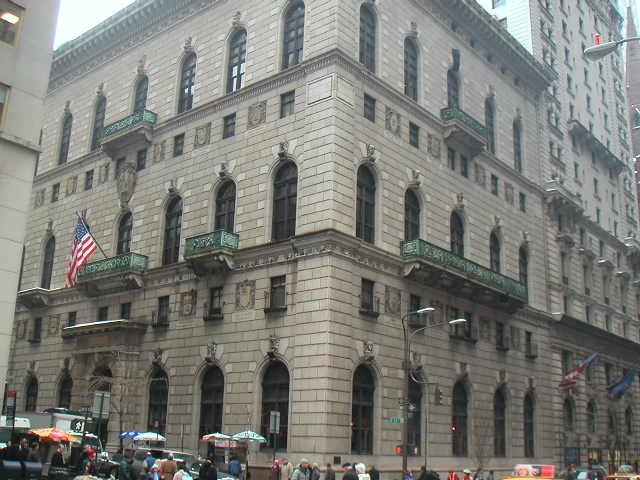 Three members of the University Club, conveniently, were Charles McKim, William Mead and Stanford White. Their firm’s design of the $1 million structure would set the bar for gentlemen’s clubs going forward. Charles McKim designed an Italian Renaissance palace similar to the Strozzi Palace in Florence. The club opened in 1899. Built of pink granite rather than the expected white marble, its six stories successfully pretended to be only three. With large arched windows attracting the eye, smaller windows set in the friezes beneath the cornice and the two stone courses become nearly unnoticeable. 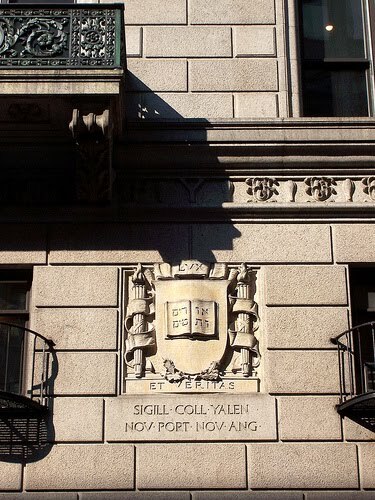 Enhancing the facade are bronze balconies and carved seals of eighteen universities. The schools were chosen after lengthy and deliberate discussions. The prestige of having its crest represented on the facade of the University Club was so great that Annapolis, which had no official seal, created one. After the building was completed, inaccuracies were noticed in two of the seals (which the club has no intention to correct). The interior of the club was remarkable even to its wealthy members. The large central entry court is lined by huge, 25-foot high green marble columns. The full length of the Fifth Avenue side is taken up by the grand lounging room with rich woodwork and crimson brocade wallcoverings. 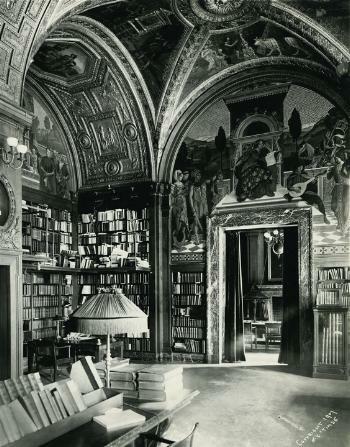 Above is the library – modeled after the Vatican apartments -- with a complex vaulted ceiling decorated with frescoes by H. Siddons Mowbray. The elegant dining room sits behind the highest level of arched windows, in a more English style of polished, paneled wood. From the pink marble and gold leaf lobby a staircase leads below street lobby to the 48-foot long pool. At one end of the white marble swimming pool, water spills from a brass lion’s head. Overhead, a painted sky fills the ceiling. With the new building came the previously unspoken question of allowing ladies into the club. Membership, of course, was out of the question; however some gentlemen wanted to show off the new facility to their wives. And so a few days were set aside for this purpose immediately after the opening. Some members were adamant. George Augustus Sala asserted that “a club is a weapon used by savages to keep the white woman at a distance.” Mr. Sala’s opinions would not be appreciated following the Women’s Rights Movement half a century later. Members were expected to conduct themselves with the deportment demanded by their social position. “Much stress is laid upon the orderly conduct of members in the Club House,” noted Alexander. Although there were instances of “infringement of rules or the canons of good breeding,” he wrote, “such cases…have been rare, and the members of the Club who unanimously desire its life to be untainted by noise, disorderly behavior, or breach of rules in any respect, have had little occasion to complain.” To this day no member is admitted without coat and tie. The atmosphere of undiluted masculine retreat was shattered when, in 1987 the Human Rights Commission filed gender-discrimination charges because of the male-only membership. After a century and a quarter, in a move that would certainly have chagrined George Augustus Sala, membersip was opened to women. Being included did not mean receiving deferential treatment, however, as Hillary Clinton and Cindy Adams, columnist of the New York Post found out in 1997. When Adams made a cell phone call – cell phones being against club rules – the pair was escorted out. Aside from its superb architectural features – which caused LeCorbusier in 1935 to say “in New York I learn to appreciate the Italian Renaissance” – the University Club boasts one of the most important private art collections in New York. Paintings by the likes of American artists Gilbert Stuart and Childe Hassam line the walls. 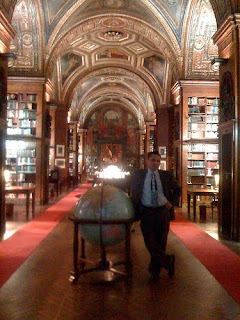 The University Club is considered the grandest of the New York City private clubs and one of the most important architectural treasures of Fifth Avenue. thanks for the clarification. edited out!